1842  Samuel Porcher Gaillard purchased the property from J.R.Spann and Hastin Jenning (1, p. 8). Samuel Porcher Gaillard either constructed a house shortly after he purchased the plantation or one was already on it (1, p. 8). Samuel Porcher Gaillard constructed a two-and-one-half story house over a basement (1, p. 5, 8). 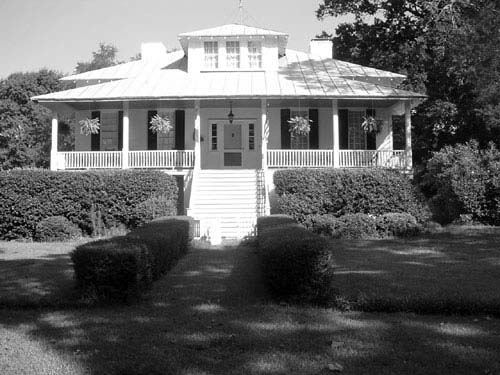 1880  Samuel Porcher Gaillard died and the plantation stayed in the Gaillard family (1, p. 9).
?  Captain Peter Gaillard resided at Orange Grove (1, p. 9). 1902  A part of the plantation, including the house, was sold to William Burrow and Emma Buford Colclough, relatives of the Gaillards, on December 1 (1, p. 9). 1920  William Colclough passed away. Emma continued to live and farm Orange Grove with the assistance of her brother (1, p. ). 1924  On April 30, Orange Grove was hit by a tornado. The storm tore off the house's roof, half story and most of the second floor. In order to salvage the house, repairs were made to reconfiguring it to a one-and-one-half story house (1, p. 6). 1951  Emma Colclough passed away and the plantation was put into her estate (1, p. 9). 1953  Julius Elbert Davis, Jr. purchased the plantation from the Colclough estate (1, p. 9). 1993  Julius Elbert Davis, Jr. still owned Orange Grove, 40 years after he purchased it (1, p. 9). There is a one-story, historic servant's house near the main house (1, p. 7).